Microsoft is sending out emails that once again inform us that the Windows Mobiel 6.x marketplace will indeed be unavailable after May 17. We all knew this was happening and that Windows 6.x was a dying OS, but it’s still sad for those of us who spent time cooking and flashing ROMs and enjoying all that WM6.x had to offer. Not that I personally ever used the WP6.x Market Place, but this may be the final eulogy of the WM OS we used to love modifying so much. 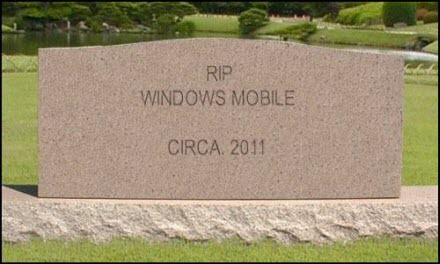 Beginning May 17, 2012, the Windows Mobile 6.x Marketplace service will no longer be available. Starting on this date, you will no longer be able to browse, buy or download applications directly on your Windows Mobile 6.x phone using the Windows Mobile 6.x Marketplace application and service. Please note: The service discontinuation date has changed to May 17, 2012. Applications and games acquired from the Windows Mobile 6.x Marketplace service installed on your Windows Mobile 6.x phone will continue to work after the service is discontinued on May 17, 2012. However, additional downloads of these applications and games from the Windows Mobile 6.x Marketplace service will no longer be available. Microsoft recommends you review the applications or games installed on your Windows Mobile 6.x phone and install any available updates in advance of the Windows Mobile 6.x Marketplace service shut-down on May 17, 2012. Please note: All phone data, including applications acquired through the Windows Mobile 6.x Marketplace service, data and user-specific settings, will be deleted from your Windows Mobile 6.x phone in the event that your phone is wiped or “hard reset.” Any data on a removable storage card, if present, will also be deleted if your phone is wiped or “hard reset”. Windows Mobile applications and games that are compatible with Windows Mobile 6.x may still be available directly from their developers or via third-party marketplaces. Thank you for your continued support of Windows Phone. Ready for a new phone? Explore the latest Windows Phones – now with over 80,000 applications and games available!